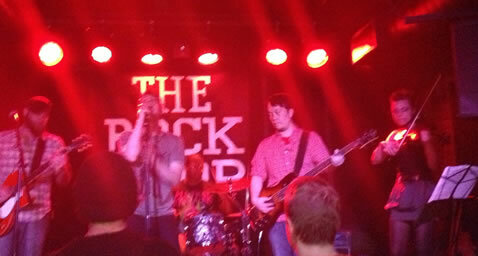 Great night on Friday at the Rock Shop. There are some great quality pics over here though – http://www.flickr.com/photos/42302753@N05/sets/72157633416832974/with/8706473011/ – courtesy of one of Crazy Pills friends I believe…. However, the biggest gamble for us was due to the keyboard breaking earlier in the week (it fell out of its case whilst being carried and got smashed on the concrete sidewalk, lost a couple keys, etc). So instead of borrowing a keyboard from someone else, or just playing a couple of songs with the viola, we (or should I say Bridget) decided to play the viola on all songs. Sounded great though! See you in a few weeks at the Paper Box.